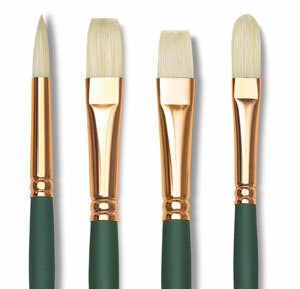 Bristles and handles are double sealed in seamless, corrosion-resistant copper ferrules and double crimped to long, green lacquered handles. 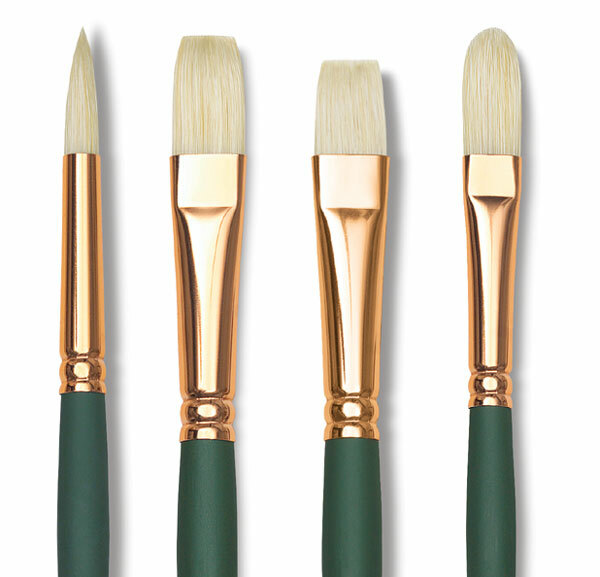 Grand Prix Oil/Acrylic Brushes, Set of 5 — This set contains one Series 1000 Grand Prix Round size 4, one Series 1001 Grand Prix Flat size 4, one Series 1002 Grand Prix Bright size 4, one Series 1003 Grand Prix Filbert size 4, and one Series 1027 Grand Prix Extra Long Filbert size 4. Extra Long Filbert — This brush is especially prized by portrait and figure painters for its sharp chisel edges. It offers fine control for detailed and broad strokes. It also holds more paint, so there is less reloading of color.